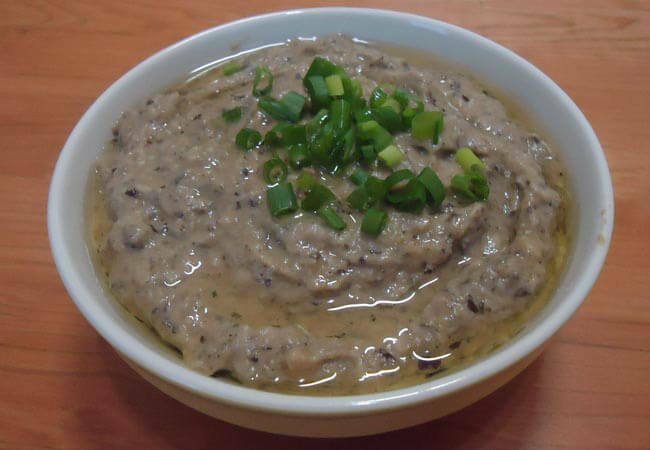 Baba Ganoush is an Arabic condiment that is prepared with combination of grilled eggplant and tahini dip. A really delicious smokey dip. Preheat the oven to 190C or Gas Mark 5. Place the eggplants on a baking sheet and roast in the oven for 20 to 30 minutes, until they’re completely soft. Remove from the oven and let it cool. (If you don't have oven then put eggplant direct on stove fire and cook until completely soft about 10-15 minutes. Remove the skin of eggplant and discard. Puree the eggplant in a blender with the other ingredients until smooth. Adjust the seasoning with extra salt and lemon juice if you want. Chill for a few hours before serving. Drizzle olive oil and serve with bread. Note: You can keep in the fridge for up to 5 days!